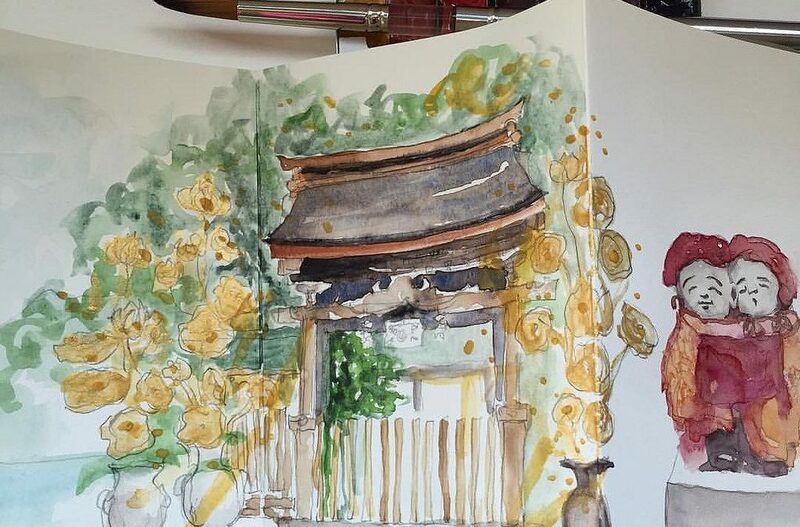 Ready to go urban sketching at the international Urban Sketchers symposium in Manchester this July 2016? Do you also find your handbag always too heavy? Walking around all day with sketching material can become quite a hassle, the weight on your shoulders can become painful at the end of the day. Being a real art supply addict I’ve got almost a whole store of art supplies at home 🙂 and I’ve tested loads of material. I have MANY great palettes of different shapes and materials, but since I discovered the pocket palette I only use that one any more when I’m travelling. My back is thankful for it… (and my bag also). The pocket palette is the lightest palette on earth (I think). It’s a very light aluminum card holder case with a magnetic bottom on which you have removable pans. The lid is the mixing area. I just made a video to show you how I fill the pocket palette with tube paint. It’s my favorite tool to go urban sketching! As it’s quite small I carry two of them: one with blues and one with greens. Even if the pocket palette is very small, these pans are really large enough to work with and to have plenty of paint to go on a long trip urban sketching! I filled it up and went on a three weeks trip to Japan, painting every day and the palette wasn’t even half empty. 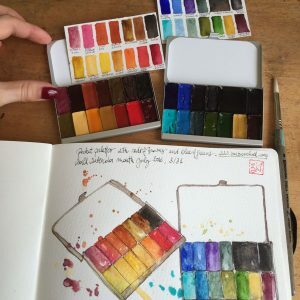 I discovered the palettes on the beautiful website “Expeditionaryart” and made an agreement with artist Maria Coryell-Martin (make sure you check her nice blog, she’s a great artist!) I can sell it in Europe :-). So they’re on sale on my website for Europeans: either empty ones or filled with high quality tube paint. I propose one with blues, greens and violet or one with reds and browns, but if you want other colors I can fill them up with the colors you would like to use if you don’t want to bother to buy tubes of paint. Whatever color you want in the brands Winsor & Newton or Schmincke or Sennelier, all artists quality watercolor paint (available in Europe). Then just mail me to tell me which colors you want on info@barbaraluel.com. It was a pleasure & delight to recieve my mini palette from Barbara Luel , this last weekend. 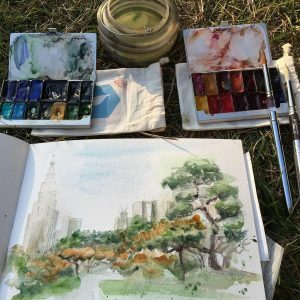 I’ve been a long time admirer of Barbara’s work, and marvel at her recent travels far & wide, and has encouraged & inspired me to take the steps to ‘going outside’ for just about my first time, I mean, to paint plein air. I will be ordering a couple more, they are so light & practical for this purpose, will also make perfect presents, coming up to Christmas. Delivery was super quick, & packaging was good to, but most important was good communication.